The island of Oʻahu is divided into 6 moku (districts), consisting of: ‘Ewa, Kona, Koʻolauloa, Koʻolaupoko, Waialua and Waiʻanae. These moku were further divided into 86 ahupua‘a (land divisions within the moku. )Punaluʻu (approximately 4,215-acres) is one of the 32 ahupua‘a that make up the moku of Koʻolauloa on the windward and north shore side of the island. It extends from the top of the Koʻolau mountain (at approximate the 2,700-foot elevation) down to the ocean. The ahupuaʻa of Punaluʻu was later awarded to William Leleiōhoku in the Māhele ‘Āina of 1848, and in 1883, was inherited by Princess Bernice Pauahi Bishop. 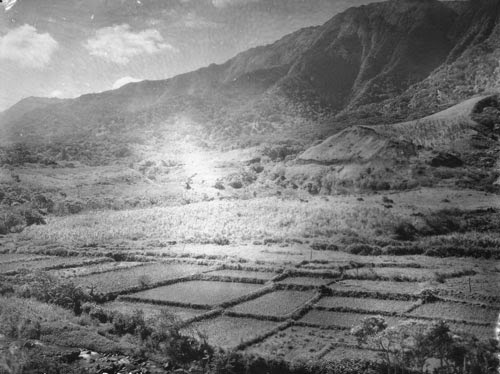 Then, much of the former loʻi were converted for rice cultivation. Many of the immigrant Chinese population, having fulfilled their labor contracts to work at the sugar plantations (starting in 1852,) came to Koʻolauloa to grow rice; initially as laborers, then taking control. In 1882 the US Congress passed the Chinese Exclusion Act; then, Japanese workers were brought in to take their place. Within only five years the Japanese constituted more than forty-two percent of the plantation work force and one-seventh of the total population. The resources at Punalu‘u were developed into significant business interests, including the development of mills and water distribution systems; and a pier and warehouses, which were situated in the vicinity of the present-day park facility. Castle was also interested in his own agricultural ventures. In 1906, he leased and acquired large and smaller parcels for the Koʻolau Agricultural Company. Under Castle’s tenure, hundreds of acres of Punalu‘u land were leased to Japanese tenants for the cultivation of taro and pineapples. By the 1920s, it was getting too costly to grow rice and there was growing competition coming from Florida, Texas and California; so, most of the rice planters had given up agriculture and moved from Punaluʻu and other areas to Honolulu. Rice production, once the 2nd-largest industry (after sugar) passed into history. Castle’s interests in the Koʻolau Agricultural and Koʻolau Railway Companies were later (1926) absorbed by Zion Securities of Lāʻie, and later transferred to the Kahuku Sugar Plantation (1931.) (Maly) Sugar was planted in Punaluʻu until the 1970s. In 1994, the Punaluʻu Community Association (formed 50-years prior to protect and enhance the rural Hawaiian lifestyle in the area) submitted a petition to designate the ahupuaʻa of Punaluʻu as a surface water management area to the State Water Commission. Part of the work includes modernizing the old plantation irrigation system that served various agricultural users in Punaluʻu. The old ditch delivery system leaked, wasted water, clogged easily and required extensive maintenance to clear obstructions. The old ditch delivery system was replaced with a new pipe delivery system, resulting in more efficient and reliable operation, as well as lower maintenance. With this, folks are also restoring the old loʻi that once grew kalo (taro,) then rice – back to kalo.